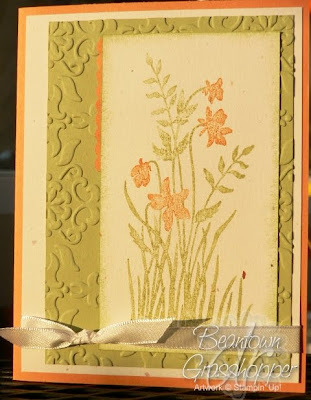 Last week I mentioned that I entered the card below in a contest at VC Rocks. I found out Saturday that it tied for first place. How cool is that? Three weeks of school completed and we have started the countdown. Ten more days and we will be one-eighth done with this school year. I was informed 3 weeks doesn't sound like a lot but 1/8 shows you are getting somewhere. Most people don't look forward to Monday but we happen to like it because it is the only day that doesn't have something scheduled on the calendar. It is a nice, slow start to the week. First attempt at a corner bookmark. I know SCS has a tutorial and I plan to look later to see if I should have done something different. I didn't look there before doing this because my laptop wasn't on and I thought, "How hard can it be?". It wasn't hard at all, although I did waste a couple pieces of cardstock. 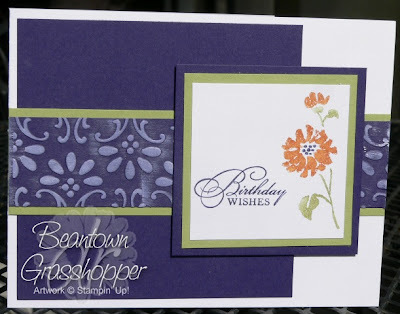 I was trying to get the Elegant Lines embossing folder a particular way for the top square and it couldn't be done without hitting the sides of the Big Shot. Still turned out pretty nice though. I must have started stamping a little late today. Usually I'm finishing up a card about the time I need to take my son to the bus stop. His days are so long. He is up at 5:30 to leave the house by 6:00. He gets back around 7:30, changes, has breakfast and I take him to his bus. His stop is about 3/4 mi. away. Some days he gets home around 4:15, others it is 6:30, and then there are the late days when he gets home around 8:30. I think he is pretty amazing to be gone so much and then come home, have dinner, work on homework, practice piano, etc. He still finds time to be on Facebook, but the longer days don't allow for him to log on. He spends a lot of his weekend chillaxin' here or with friends and doing a little bit of work on some merit badges. He has a goal to finish his Eagle rank by summer, with it being presented in August or September. You didn't come here to hear about his schedule and how much I love him though . Today's card is simple in design. I inked up the image with More Mustard and then colored with the markers. Originally, I was going to have a half-circle of rhinestones on the right side of the image but I thought that would be a bit much. I settled for the rhinestone in the center. 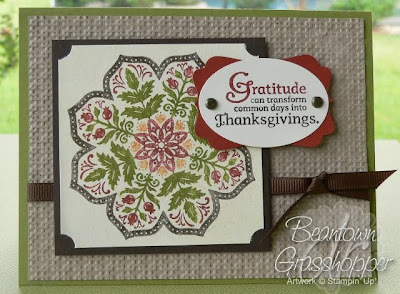 I love the rhinestones Stampin' Up! has because they seem to sparkle more than other brands I've used in the past. I entered this card in the VC Rocks contest that ended last night. There were some pretty amazing cards entered. 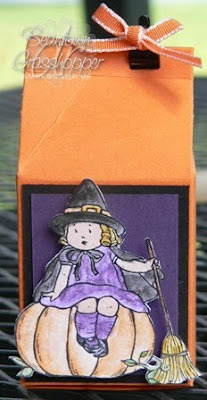 I was challenging myself to use the smaller images in the stamp set because I have been so focused on the larger image. I have fun coloring that image with markers and changing up the look. I'm off to a busy day full of meetings, grocery shopping and cooking dinner for a family that lost their mom during childbirth. So sad. You don't really hear of that happening nowadays. 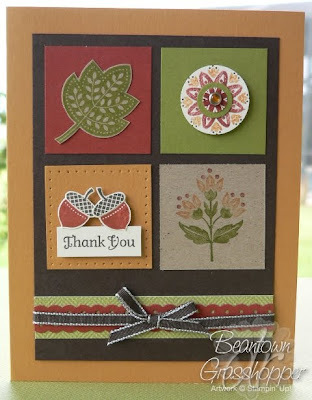 I'm kind of sad that this is the last blog hop for the summer for VC Rocks. I've had a lot of fun participating and hopping around. 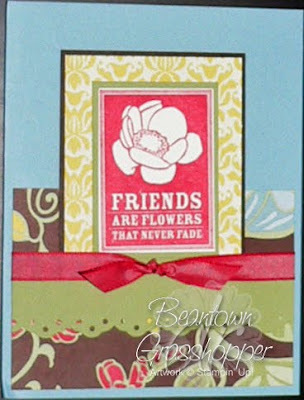 You should have just come from Brenda's Stamping Corner. When I verified the link, I checked out what was on the front page of her blog. Oh my heck! If you scroll down to "Just Add Ink Challenge #30", check out that poodle skirt. That is cute! You should go back and look, especially if you like punched art. I've mentioned a few times on here about how I have so much DSP and I never seem to use it. How I've taken to leaving it out on my desk so I will use it more. I'm not sure if this is good or not because I feel obligated to make a card with it when I see it. I must talk about it enough around here because one of my kids commented "check you out using the DP!" LOL I was happy they knew what I was talking about when I say DP. The colors are off on this card. I forgot to change the settings on my camera and did a quick correct on it. One of those rare times I had my camera on a manual setting. I was trying to get a picture of lightning off in the distance. I did get four pictures but nothing really spectacular like you see in National Geographic. The swap I participated in had you pick a card from the catalog and either change the set or the colors. I changed out the set. I couldn't find the recipe on the SU site for the catalog, so I kept it the same color scheme. I'm guessing Pumpkin Pie was used but I liked the Peach Parfait with the taffeta. 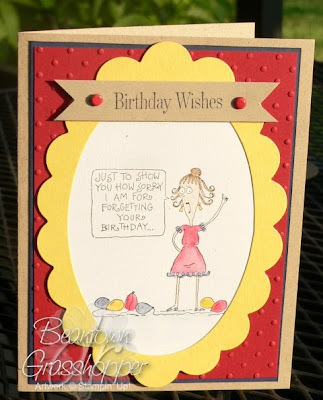 The card I used as my template is found on page 140 of the current catalog. I love the name of this set, Just Believe. There are so many things we have to "just believe" in, have faith in, and you know they are or will be because of the action that goes into them. My first card with this set. The color is a little off because the sun is still rising, however, at the same time, it seems appropriate to have the golden glow. I made two cards Saturday using this set. I have quite a few more ideas for this set but I'm totally focused on swaps . . . still. 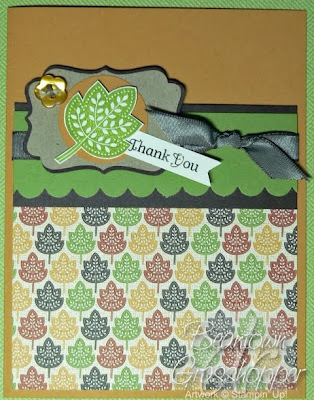 I'm using this card for one swap and the other card I entered into a contest. It is cloudy today so I wasn't able to capture the shine of the Smooch spray on the main image. It is the first time I've used it and I love it. This needs to stay short because I have a meeting to get to. Lots of cards to share this week. 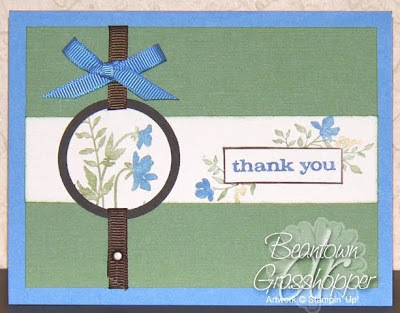 Note that I used the new decorative label punch from the holiday mini. I cut off the points from the top and bottom. They poked around the oval just a smidge but just enough that I felt the need to make them disappear. I'm trying to come up with a Christmas card for a swap I'm in. I didn't plan to use this set but an idea came to me yesterday when I was working in the morning. Today I got it together. I like it but I don't think I'll be doing it for the swap. The bow are a booger to get going in the right direction. I have this mini milk carton die since it came out and today was the first time I've used it. 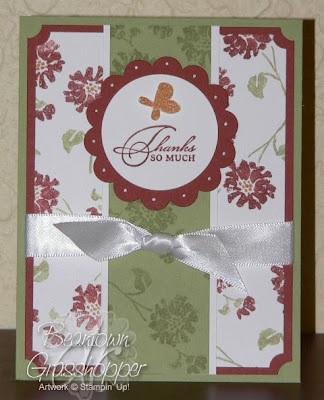 I had it in my head that it was bigger but it is a nice size for favors, something to hand out in class. The pixie sticks would look cute coming out the spout but they would be quite a bit larger than the carton. The black cardstock under the main image is cut 1-1/2" x 1-7/8" to give you an idea of how big this is. 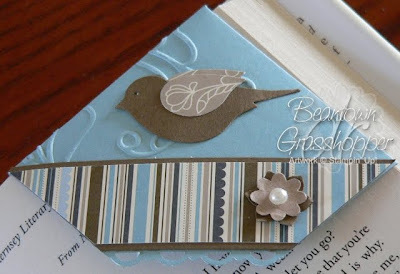 I was checking out some digital scrapbooking blogs and came across a card like the one I made above. It was using a kit one of the designers made. Seeing all the squares, I was thinking it was a fun way to show the paper in our Designer Series Paper. I still have way too much DP and every time I get another pack, I promise myself I will use it. I don't. Island Oasis has been sitting on my desk for a couple of months. I've even made several cards with Tropical Party. Today I used some. I have to keep telling myself it is OK to use this set still, it is after all, still summer. Today was the first day of school so I'm feeling like summer is over even though it is mid-90s and won't be fall-like for about 3 more months. Today I wanted to make some cards that wouldn't require extra postage when mailing. This morning I started off with this card. I liked it but it seemed a little plain. 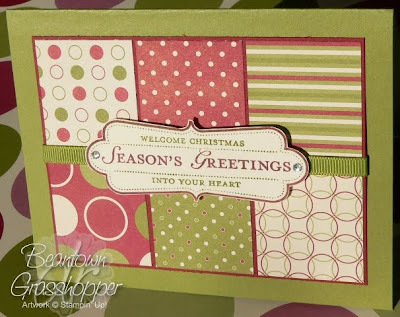 I added the perfect polkadots embossing folder and switched the colors around. Definitely liked the Concord Crush better and went back to that. 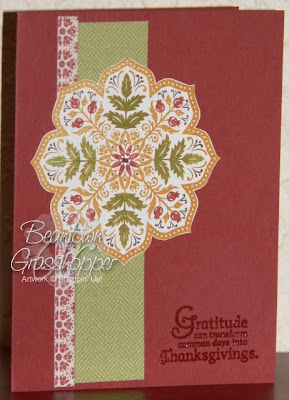 I can't decide which embossing folder I like better for the embossed strip but I'm leaning toward the Finial Press one. Today is going to be a busy day. We registered our son for high school this past Saturday and today I get to go to the middle school and elementary school for the three girls. I'm not looking forward to it, however, I expect it will go a lot smoother since we've been here a year and they are established in the school system. I like the colors of today's card. Unfortunately, I can't get a good picture. The sprinklers were on this morning so everything is wet outside. This set has always cracked me up. This particular stamp has always tickled me and I've never had a need to use it. Either I remember your birthday or I don't. The person I made this for, I remembered her birthday, I just failed to schedule my time well enough that I was able to get it made in time. Each week it seems I get a little done on different things I wanted to include. The funny thing is I bought her gift 2 weeks before her birthday. It still won't make it in the mail today. My van is in the shop for some routine maintenance. I make no promises on tomorrow since I'll not want to be out longer than I have to with the school registrations.